Do dogs need a bed to sleep on? Do dogs like dog beds? What is the best type of dog bed? What material is best for a dog bed? What are dog beds filled with? Are elevated dog beds better? Having a pet is a responsibility that most of us take very seriously. As a pet owner there are number of things to take into consideration. Their health, safety and comfort being the main ones. When it comes to choosing the best dog bed for your furry friends, there are many questions that pet owners have. Making the right choice when purchasing anything for your dog is really important. It can make a big difference to your pets overall comfort and security. It’s also important that we know that our dogs is are in good health and not suffering unnecessarily. These are all things that are very important to you as you want to know that you’re doing your best for them. Whatever size, shape or age your pet is, they are a part of your family. You want to take good care of them and have them be with you for as long as is possible. As a dog owner of a number of dogs over the years there have been several. From a German shepherd, Yorkshire terrier, Old English sheep dog, border collie and Golden retriever. I have a very good idea of how different a pet can be from their temperaments to their needs. The needs of your pet will vary considerably depending on their size, weight, age and sleep habits. You want to make the best choices for the comfort of your four legged family members. But sometimes you are not quite sure what that is and may need a little help. It can certainly be confusing when you have so many dog bed choices available to you. It’s only natural that you may have some questions. Being armed with more information can help you make the right buying decision for you and your pet. We’ll do our best to answer some of the most important and often asked questions. When it comes to finding the best dog bed for your pet you may find this helpful. We all like to have some space to call out own, so why wouldn’t your pet? Many people think dogs can curl up and sleep comfortably almost anywhere. However, your furry friend really shouldn’t be sleeping on the floor all of the time. Besides the comfort factor, sleeping on a floor or other hard surface can damage your dog’s health. Something else to consider is that when you give your dog a place of their own to sleep it’s better for them and you. It will keep him or her from taking a dog nap in places you may not want them to, like maybe your bed, or your couch. By having their own bed, when they feel the need for some quiet time to themselves, they know they have a place where they can retreat to. I would say the answer is a definite yes! Sleeping on any hard surface can be uncomfortable and cold especially in a draughty place. It can end up causing damage to your dog’s health. If you have an older dog you should definitely consider getting an orthopedic dog bed. These senior dogs need a good supporting bed more than ever as their joints stiffen. Senior dogs are far more prone to arthritis, hip dysplasia and other health conditions. However, younger dogs can have joint issues too. Some pet owners have a bed for indoors and one for outdoors, especially if their pet spends a lot of time outdoors. Some dog beds for the really big dogs require something much stronger and firmer than the smaller breeds. Also, some beds feature health-promoting aspects, which is essential as your dog gets old and achy. Some beds are filled with cedar chips which may help keep odors under control. However it’s important to know that cedar chips are not good for dogs suffering with allergies. Some dogs may take a little gentle persuasion if they have never had a bed before. Of course they would have to get used to using it first. Why wouldn’t they like the comfort of it? It’s a safe, soft and warm place for them, and a pleasant change from laying on the hard floor constantly. It’s really important to find a dog bed that fits your specific pet’s needs. Something that they can be comfortable in. Having a place of their own will not only keep them happy but will stop him or her from bugging you, or from damaging anything else as they try to nap. Do encourage your dog to use it though, especially if you want to save your couch or whatever your pet likes to nap on. Get them used to it and they’ll know where they need to go to rest and sleep. First consider whether your dog is already full grown or do they still have some growing to do? There are a couple of ways people use to find the best size bed for their pooch…One way is to actually measure your dog for a bed. It’s best to measure them while they are sleeping. Take your tape measure and measure from tip to tip, nose to tail. Then add another 9 to12 inches to the number you got when measured. This will give your furry friend some extra room to move around and spread out. It’s also a good idea to measure height that may be necessary for some beds, from laying down position measure from floor to shoulder. If you have one of the smaller or medium-sized dog breeds you’ll find that you have many more choices available to you. There are more because these beds are smaller and more compact. It’s not a good idea to purchase a bed that’s too big for your dog as it can leave him/her feeling insecure. If your dog is still in the growing stages you may want to go by their expected breed size. Guides do vary as to what constitutes a small, medium or large dog, there are varying opinions on this, so it is just a guide. X.X.L Jumbo: St Bernard, Leonberger, Irish Wolfhound, Bull Mastiff etc. This is an important decision to make, and there are many options to choose from. Some dog owners find that a large memory foam mat is the best choice for their larger dogs. The most popular choice is the orthopedic memory foam bed. The benefits are that it conforms to your dog’s shape while still providing support for arthritic and aching joints. An important factor to consider with aging dogs is that they are also often more prone to bladder leakage. In this case you would want to look for a waterproof orthopedic bed or at least one with a waterproof washable cover. If the bed you choose is in the higher end price range it’s probably a good idea to check if they also offer replacement covers. Foam varies in its density and depth. You can expect that a good bed for jumbo sized dogs are more costly. Many manufacturers use 4 inch foam. 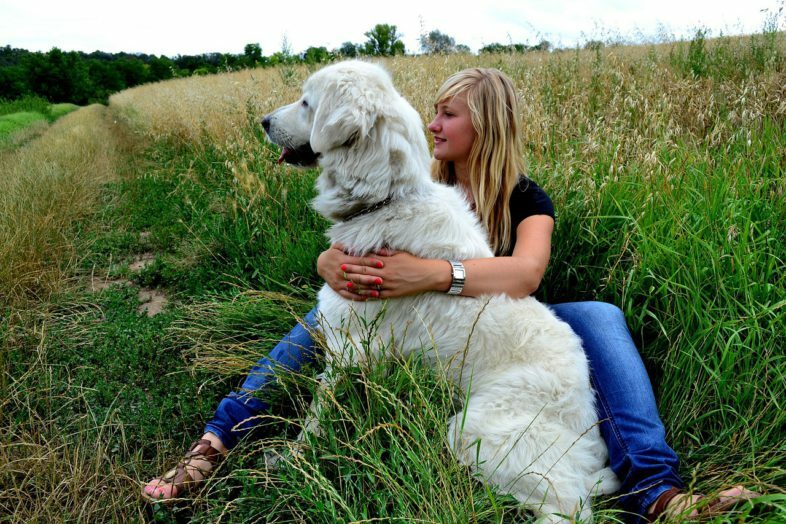 There is a company that manufactures very sturdy beds for jumbo sized dogs. They are especially recommended for seniors and those large dogs with joint issues as they use 7 inch foam. While some may find that the easiest solution is to buy a dog mat, others find a pillow bed is the best choice for a large dog. Some dogs like to put their head on something like pillow, others like them because they feel more secure. For these pets that like the more closed in feeling you may want to consider a donut bed or a nest bed for them to cuddle into. Other dogs like to burrow so you may want to look into one of the cave type dog beds in this instance. There are certainly many options open to you. There are a number of things you need to take into consideration when choosing a bed for you furry friend. Start by paying attention to how your dog sleeps. Knowing about your dog’s regular sleeping habit is an important part of selecting the right bed. You need to make sure it’s the right size for your specific dog type and their sleeping style. Some dogs tend to mostly curl around themselves, and others lay full out taking up more space. You need to know your dogs size and it’s best to measure your dog while its sleeping. You want to give your dog enough space to lay down comfortably when they need to. Also think about any special requirements you may need. For instance many homes have more than one pet, if so, do they like to sleep together or apart? If they sleep together then you need to take that into consideration when looking at the size of bed required. Someone I know of has a large bed and has 2 medium size dogs and a cat that sleep in it. There are a number of individual circumstances to take into consideration. Also consider how mobile you are, do you travel with your pet and need to take a dog bed with you? Choose the best material, some dogs are pretty rough on stuff and like to chew. If you have a chewer and need find a dog bed that’s chew-proof. The best choices are beds with abrasion-resistant materials, also some PVC or canvas beds could work. Some companies will say they do not recommend their beds for chewers. Other say that their beds are very sturdy so watch for this when choosing. As mentioned in a few places, it’s important to find a bed that will support your pet and be comfortable. It’s best to buy a dog bed made with a high-density support foam to provide soft support for your pet. And to help relieve aching joints, arthritis and hip dysplasia conditions. Again keep in mind that you need to consider the size and weight of your dog and get them something with good but soft support. Many of the dog beds for large dogs like German Shepherds, Golden Retrievers, Labradors and Dobermans etc are made of orthopedic foam. Often memory foam, which offers better support for a bigger dog’s weight compared to lower quality foams and materials. Also the Jumbo sized dogs like Leonberger, St Bernard, Great Danes and English Mastiff need much sturdier and supportive beds in this case expect to pay a bit more. These beds have covers (some removable for washing, others are not). They’re usually made of cotton, polyester, faux suede, fleece, or other soft materials. It depends on the bed you choose. A popular fill is a spun polyester that is machine washable. It gives the required warmth your pet needs at times. Plus it’s soft and comfortably accommodates a pets body shape. This type of dog bed fill is soundless and helps pets to be comfortable. Older dogs that may be suffering from arthritis need comfort, support and relief that is offered by therapeutic memory foam dog beds. There’s also cedar chip beds. Please note cedar is safe when used in commercial dog beds, but can be a health hazard to a pet who is suffering from allergies. These are some of the best reasons why you would choose an elevated bed for your four legged friend. With an elevated bed your dog is lifted off the floor. This will help your dog be more comfortable and keep them at a comfortable temperature. With this bed your dog doesn’t get too hot or too cold, and is kept out of draughts. Air can circulate around the bed making it more comfortable temperature wise. Although most beds could be considered raised to a degree, just not as much as these. Just like humans our pets can have health problems that can make it more challenging for them to get comfortable. I think many of us that use memory foam will agree it helps. It can give your furry friend the same health benefits it gives their owners. You have to decide if these orthopedic beds are worth it to you, but I think your pooch would think it is. Often pets suffer in silence, they don’t show us their pain so we just have to watch for signs. A quality Memory foam orthopedic dog bed may be more expensive but worth the investment. This is a great option when choosing the right bed for your pet especially if it has health issues or is old. Depending on the size be prepared to spend between $50 and $400 for a good quality orthopedic dog bed. I think we’ve pretty well covered that it is in other areas. Many large dog beds are made of orthopedic and memory foam. It gives better support for larger dog’s weight compared to some less dense foams and other materials. Many of these beds do have removable covers for washing. They can be made of cotton, polyester, fleece, or other soft materials. While memory foam dog beds are recommended for large and older dogs they;re for any size and type dog. Sleep promotes healing and a reduction in pain for both pets and their owners. We’ve covered many of the questions as you search for the best dog bed. Hopefully this information useful in making your final choice.